LoveLight : Inspiring South African children, through Unity and Ubuntu, to express their fullest potential. LoveLight is serving the kids in South Africa, to rise above the circumstances of pandemics like HIV/AIDs and poverty in the post apartheid era. We fund programs and provide volunteers to give these kids hope in a brighter future. Providing camps for youth that transform their self-esteem, teamwork, trust and hearts. 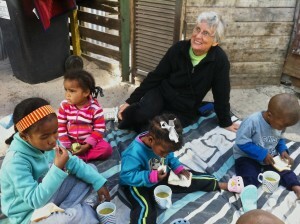 Connecting through South African Nonprofit Organizations to support sustainable futures for the children. Training and support for volunteers going to South Africa. Seeing wholeness in all people without a need to rescue or fix. How does LoveLight’s work to make a difference in these peoples lives? Since 2003 LoveLight has provided the support of the communities directly helping kids see a way to rise above their circumstances. Being of service, in empowering leadership, reflecting the good in all things and assisting their continued education, is the heart of the program. LoveLight brings deep integrity, heart and hope to every child reached.